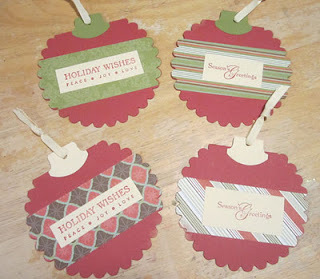 Festive Friday is a Blog Hop happening the second and fourth Friday of each month, showcasing Christmas cards. We are rounding out the year, this is the last month in 2011 for our hop! This is a card made from a folded card base cut on the Big Shot with the Scallop Circle die (#113468), you can see the top edge is where the fold is placed just inside the die, so the card will still open. The top is capped with the Round Tab punch (#119864) that creates a double sided "Ornament" card. Embellish with sentiment, ribbon, some pattern paper cut in the die as well, and you have a quirky little card to cheer someones holiday. Variety can be created with different papers and sentiments, and of course you can bling up the embellishment - these are obviously a simple version! You could add a cropped photo (they are a good 4.25" diameter) or some buttons or layers for more texture, or get elaborate with your detail and add some die-cut swirls or images. Pick your favorite ornament off the tree, and recreate a version to send out! These are a great project for a group, adults or kids, to make; and as they have ample room inside for signing, a great card for a group to send as well. 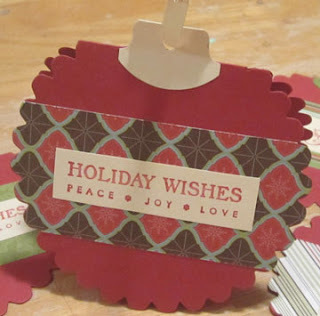 love the cards and the idea is a great - I love anything that can be hung on the tree and saved for display over and over again - i can see adding the kids picture to the inside to give to family! very clever! love that...I have that die i'm so making some of these! OH MY GOSH... HOW CUTE ARE THESE!!!!!! I love the idea... Love the tab punch for the hanger to attach!!!! AWESOME!!! TFS!